You'll need to gather some supplies...the most important one being, and old cabinet door! I was lucky and had two in my basement from the time I removed the doors off my kitchen cabinets, to create an open shelving look. If you don't want to go that route, I would suggest checking out your local Habitat for Humanity or salvage yard in hopes of finding one. 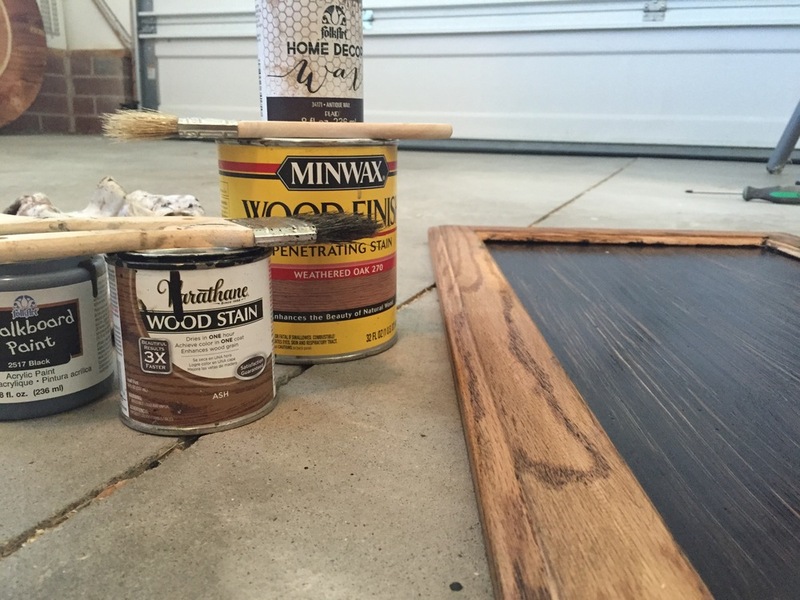 You will also need sand paper, (an electric, hand sander will speed up the process if you have one), black chalkboard paint and finishing paint or stain of your choice plus brushes and a clean rag. If you like the added touches like the wreath and the ribbon you can look for fun things like these to add once finished. Start by sanding the original finish off the cabinet. I used an 80 grit paper that has a very rough feel. Once sanded, wipe off all the dust. I chose to paint the chalkboard insert first. The first coat always looks terrible, don't be scared! I ended up painting 3 coats of the black chalkboard paint, making sure each coat is completely dry before adding the next. Then I taped of the inside to prepare to finish the frame. I wanted a weathered, white wash finish, so I started by darkening my wood with a combination of stain and wax that I had on hand. Feel free to play around with what you already have to keep the cost of this project low. You just might create a new favorite finish! After that layer was dried, I painted over it with white chalk paint. I only did one coat of fairly full coverage. Once that dried, I sanded the edges and lightly overall, for a worn look. I used a medium grit 120, sand paper for this step. I then wiped away all the dust and rubbed the edges and worn spot with dark/antique wax and buffed the excess away. Last I used the white again in a dry brush technique to add a bit of brightness back in. Here you could choose to be done, and write your message, or add some fun, finishing touches like the wreath and ribbon. For ease of hanging, I hammered this picture anchor to the back. I love how simple this was! All in all, including dry time, this project was complete in less than 2 hours. The best part? It will be so easy to change it up for different seasons. And when I get tired of it at my front door, I can simply move it indoors! This is a very versatile decoration piece, I hope you love making one for your home! If you come across any questions or have any comments, please leave them below or email me at theothersideofneutral@gmail.com I love you hear from my reader friends!